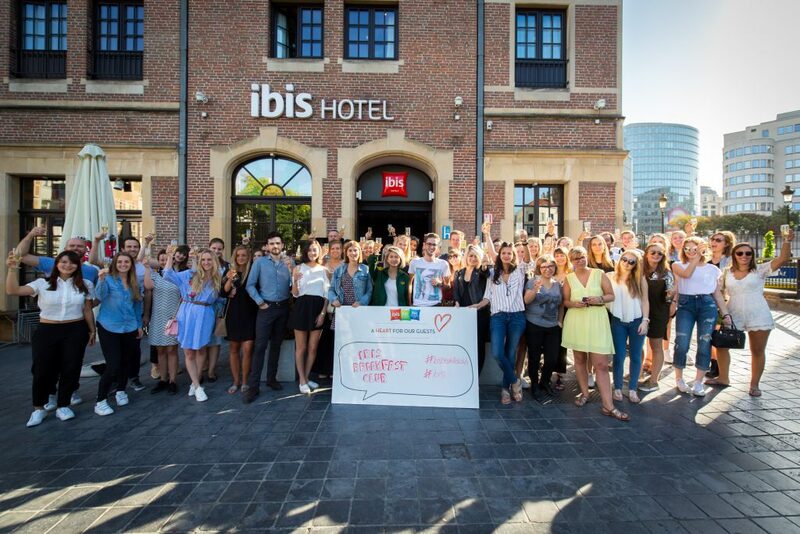 Have you seen my latest vlog about the Ibis Breakfast Club event in Brussels? If no, you ahead and watch me ‘die’ whilst working out together with my fellow blogger friends and see me in my best ‘morning face’ mode. If you’ve seen it: thank you for watching. I really hope you enjoyed it! In this post I will show some pictures and give an extra explanation about the workshops and the intention of Ibis. You’ve heard me talking about the Ibis Breakfast Club way too many times but I never gave a decent explanation. 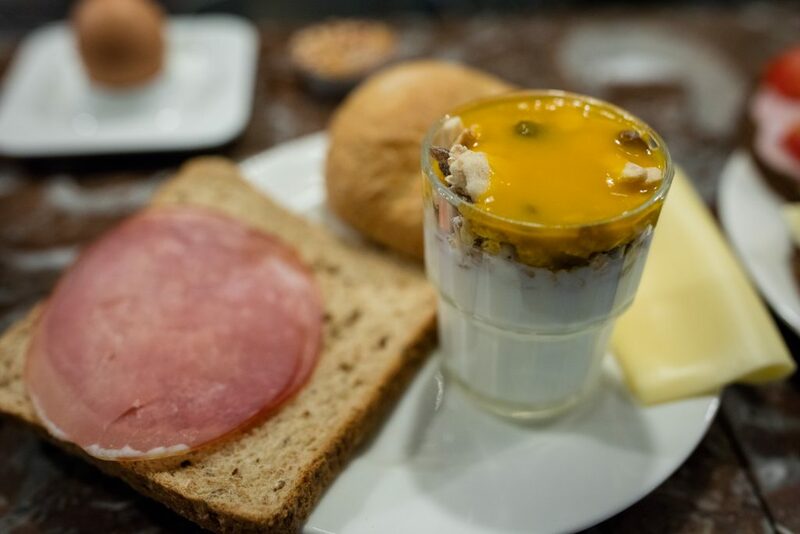 The Ibis hotel chain, part of Accor Hotel group, invited a bunch of bloggers because they believe a good start in the morning is the beginning of a good day. The Ibis guests have always been a priority to the hotel chain but now they wanted to go further than the promised good nights sleep. 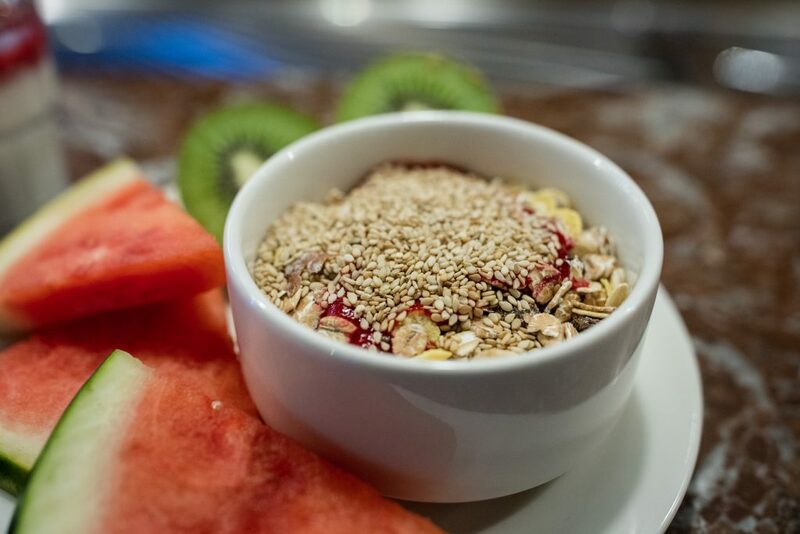 A good breakfast is the key to a good start of your day and therefore they have launched their new Ibis Kitchen Breakfast. 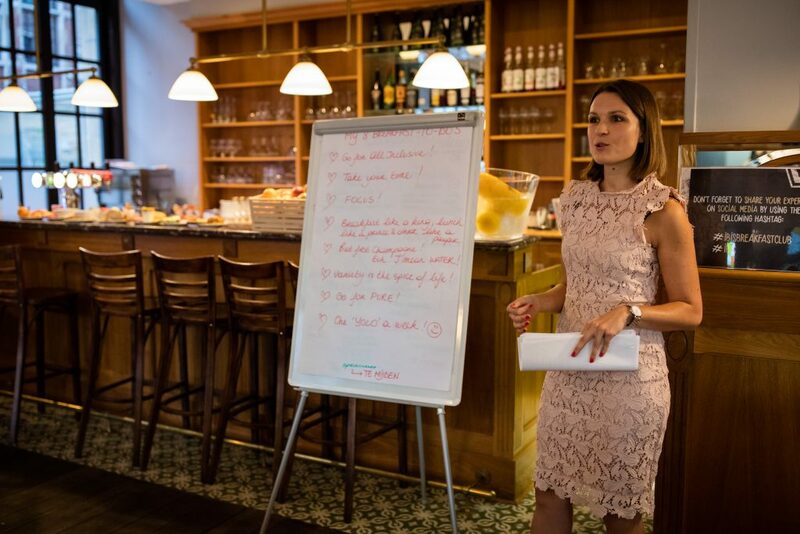 Ibis worked together with food coach Charlotte Vande Riviere, body and mind alignment coach Goedele Leyssen and the organisation Swissjump to find the ins & outs about vitality and a good breakfast to start the day in a fit and happy way. Waking up in a good mood is definitely a gift lot’s of people miss in their lives, including me. I do try my best but at 4 am, I’d rather think about how nice I was laying in bed. 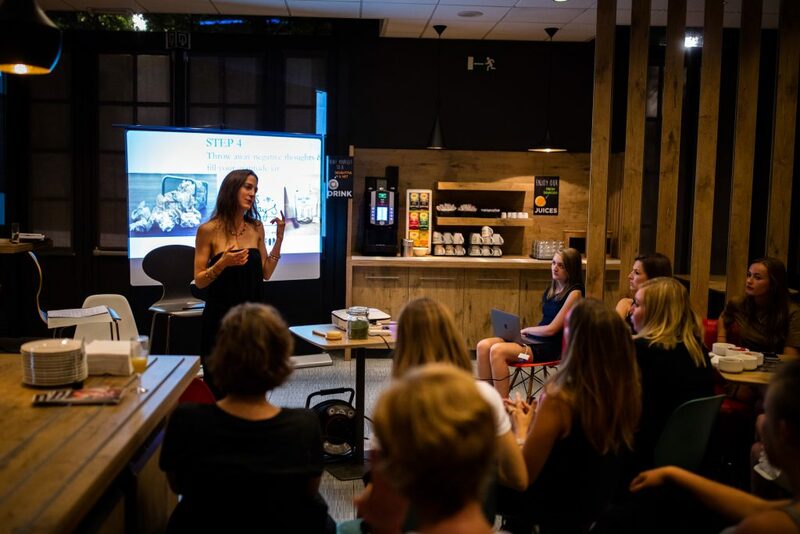 If you really want to become a morning person, Goedele gave us some amazing tips on how to start your day. Getting up and going to bed earlier will have a great effect on your body. Creating extra time for yourself in the morning means you will be less stressed throughout the day. You’re also living according to the natural rhythm of your body. Normally your body makes stress hormones between 4 and 6 am to wake you up and starts making melatonin around 9 pm to become sleepy. It’s definitely worth the try because morning people have less risks to become depressed or overweight, have less stress and perform better throughout the day. Every night, your body detoxifies and the poisonous toxins will gather on your tongue. To prevent that you swallow those, it’s better to scrape your tongue in the morning. According to the Ayurvedic texts, Chakara Samhita, the tongue scraper needs to be gold, silver, copper or tin. A glass of lukewarm water with the juice and pulp of half a lemon with a teaspoon of olive oil are perfect to detox your body and to wake up your intestines. In stead of the normal cup of coffee to get up and running, try some peppermint oil! A few drops of essential peppermint oil in your hand palms, rub them well and breathe well three times while holding your hands in a little bowl. Doing breathing exercises in the morning can help with your mood and energy level. Studies show that people who do these exercises in the morning have the feeling they have more time throughout the day. 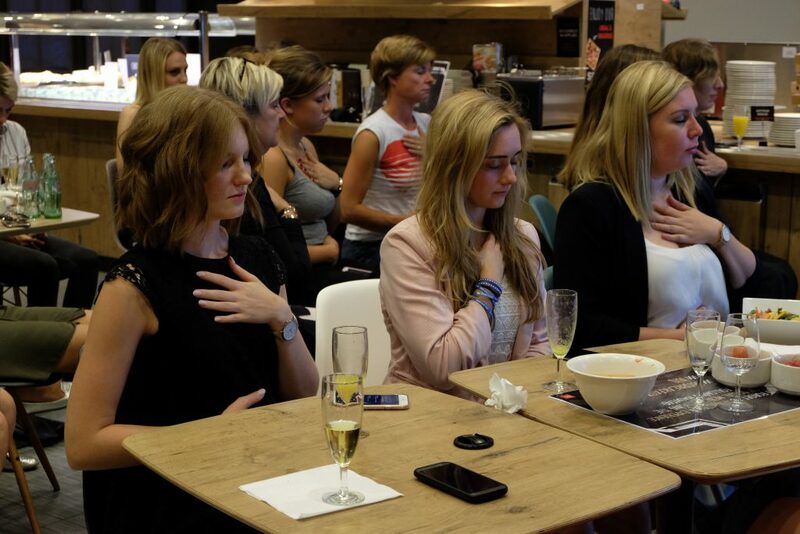 HOW: Breathe in from your belly. Imagine there is a balloon at the same height as your stomach. Blow it up through your navel and empty it while breathing out. PRACTICE: Lay your hands on your legs. With four fingers on your right hand, search for your pulse on your left wrist. Breath in, in 4 heartbeats and breath out in 8. Do this for three minutes. A cold shower has a lot of advantages. It makes your skin glow and tight (natural facelift), you will have a better immune system, stronger nervous system, better blood circulation and less subcutaneous fat. A cold shower will give you a Popeye-effect, works detoxifying on your organs and keeps your glands and organs in top condition. Also try to rub yourself with some almond oil. Not a fan of cold showers? Splash some cold water between your eyebrows and upper lip. An instant wake-up call. The peak time of your liver is around 11 pm to 1 am at night. If you eat late then the liver is busy managing your digesting process and it doesn’t have the time to fully concentrate on cleaning the blood. If your liver cannot complete its goal at night, you will wake up with a hard head. Eating later than 6 pm? Opt for something light. The better the sleep, the more eager you are to get up! If you have negative thoughts, write those down and throw them away. Another way to get rid of them is to make a gratitude jar. Write down a good thought a day. Read them at New Years Eve and your night will be perfect! The quality of the night will determine the quality of your next day. When you sleep on your right side you will automatically start breathing more through your left nostril. This will activate your parasympathetic nervous system which will make you fall asleep much faster. 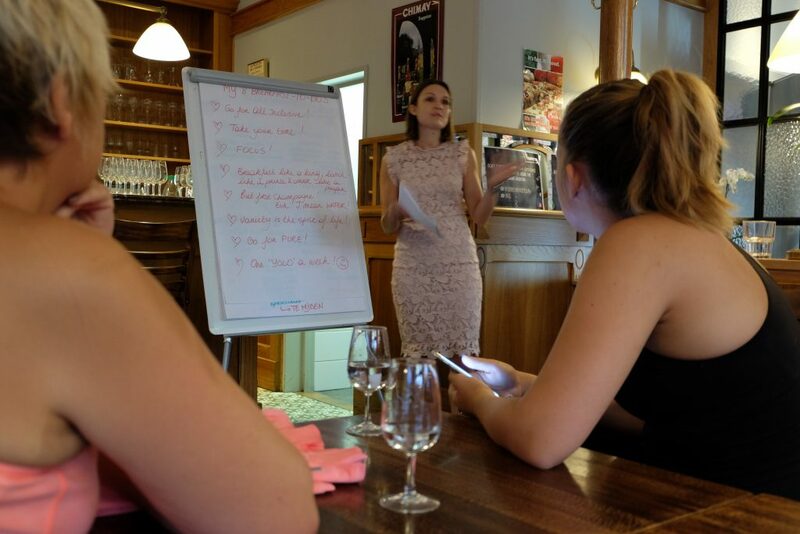 On day 2, my group started the day with a workshop about a good and healthy breakfast. Often we are so stressed and in a hurry, we forget to eat properly. Charlotte gave us some great breakfast tips. How to start your metabolism. The first meal after getting out of bed isn’t something we are supposed to skip. We need the energy to start our bodies, just like a car needs gasoline to get started. Between the meal of the night before and our breakfast usually lays a period of about 10 – 14 hours. The body relies on our energy reserves during these hours. This means we need new nutrients and energy to start the day well. No breakfast means we are more tiered, we cannot focus well, an irregular bowel movement, and so on. Yes, we can forget our breakfast and it’s no a disaster. As long as it doesn’t happen too often! Skipping your breakfast will result in less power and weight gain. 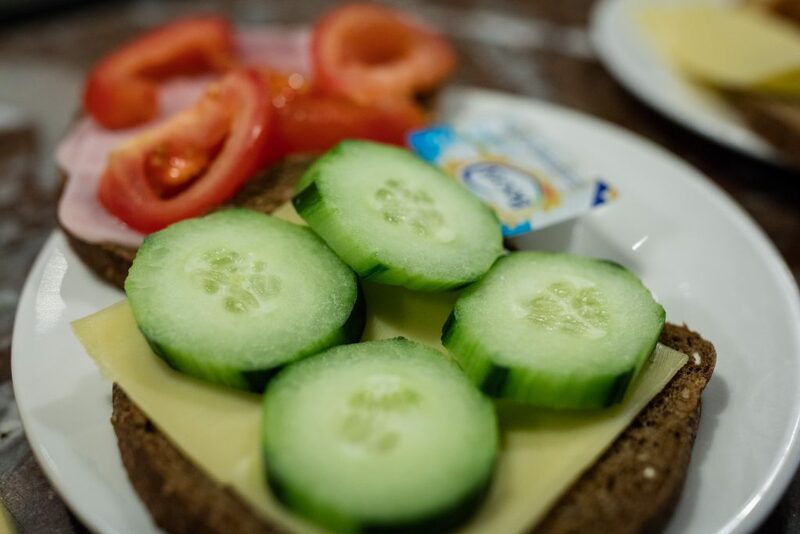 The base of a balanced diet consists out of three full main courses and healthy snacks if needed of which the breakfast is the most important. If we eat a wrong breakfast our sugar level can be confused during the day. A wrong breakfast or no breakfast at all is most likely the cause of us eating candy all day. Studies have showed that people who eat a balanced breakfast, snack less throughout the day and eat less sugary. Important when having breakfast is that it is balanced. Make sure every essential ingredient is present: carbs, proteins and healthy fats. Eat in a calm way and don’t rush eating. Chew well and give your breakfast the attention it needs. If you need to get up really early, a good tip might be to prepare (partially or fully) your breakfast the evening before. 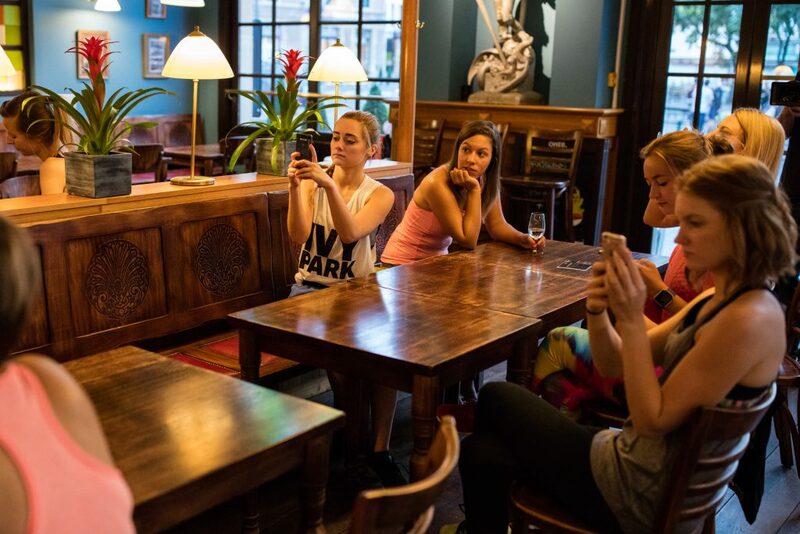 Don’t check your social media while eating breakfast. Fully concentrate on your breakfast. Chew at least 10 times because, yes, it makes you more slim. Our breakfast needs to contain at least 25-30% of our daily intake. It makes sense because after a day of activities, everything will be burned. When we eat late or when we are eating while we are sitting on the couch, our bodies will save everything quicker because we don’t need the energy anymore. Start the day with a big glass of water! It’s a good habit and gives you 200 ml fluid. Get your metabolism up and running in the morning by providing your body of the fluids it needs. Water helps to detoxify the body and helps with our cravings. It will also make you feel fuller while eating so you eat smaller portions. Perfect if you want to loose some weight. Try to mix up your breakfast. Don’t eat the same thing everyday because it can get monotonously. The more we variate, the more channels our body needs to address to get our body working. Try to avoid processed ingredients and especially refined sugars. If your first meal of the day is very sugary your will get a sugar rush throughout the body which will result in more hunger or candy cravings. Choose for whole wheat bread, pure oatmeal, pure muesli with almost no dried fruits, whole wheat crackers / rice waffles, .. If we eat a pastry every two weeks, Nutella spread once a week orsome crunchy muesli, is it unhealthy? NO !!! We need to look at the total package. If you eat healthy every day of the week and have a balanced breakfast you can definitely have some fresh pastries once in a while. But eat one in stead of two and eat other ingredients to make your breakfast more balanced. if you eat sugars, eat them in combination with fibers and proteins to reduce the sugar peak. 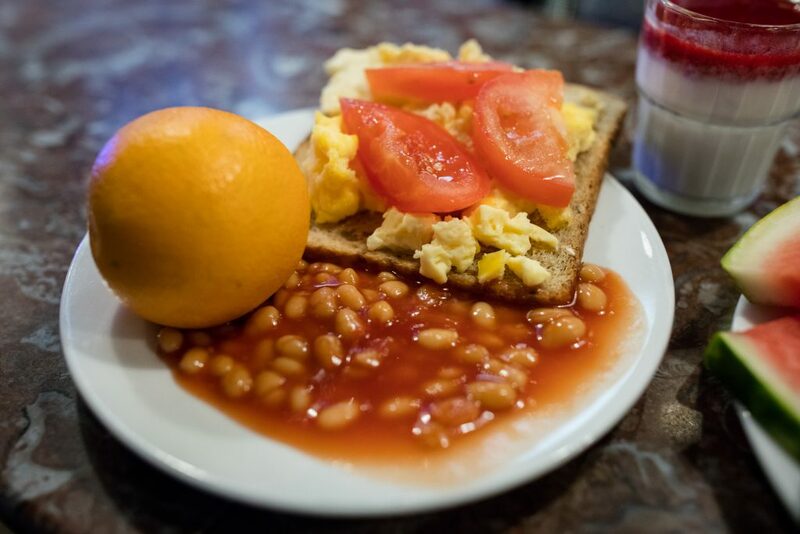 What is a balanced and healthy breakfast? Every head ingredient should be present: carbs, proteins and healthy fats. Goal: head supplier of slow carbs that give you energy and make you satisfied. Use the whole wheat versions which consist out of more fibers. Goal: the building materials that take care of the growth, building and recovery of our body. They make sure you stay fuller for longer. Goals: most fats will deliver energy. Choose for essential and unsaturated fatty acids, they give you energy and extra vitamins. Goals: delays the rise of our blood sugar level. After the workshop with Charlotte about a healthy start of the day with a good breakfast we were all ready for our Swiss Jump workout. If you watched my vlog you can tell I was suffering really bad (hahahaha). It was fun and it was definitely a very good workout! 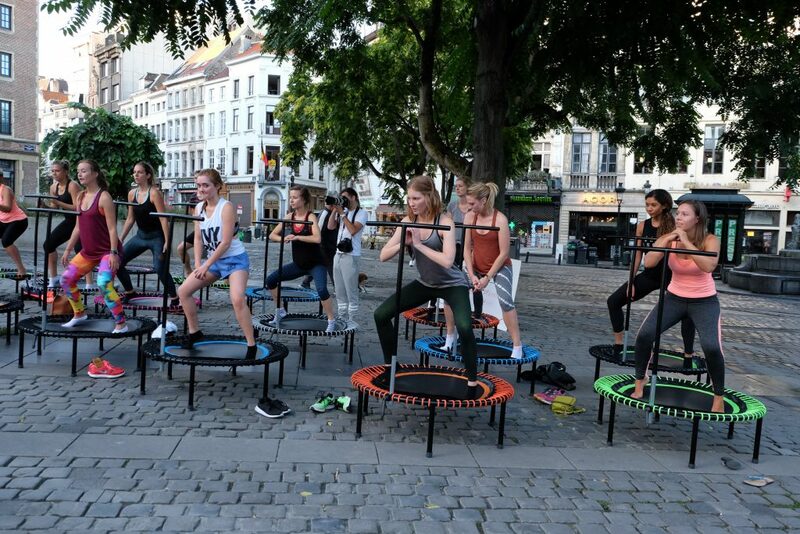 Swiss Jump is a new fitness rage coming from Switzerland. 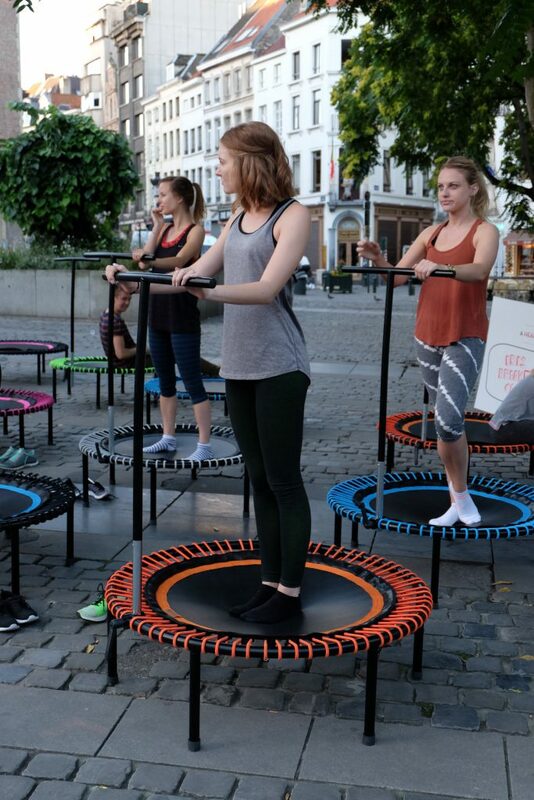 Mini trampolines promote the endurance, muscle power, balance and coordination on a fun and natural way. 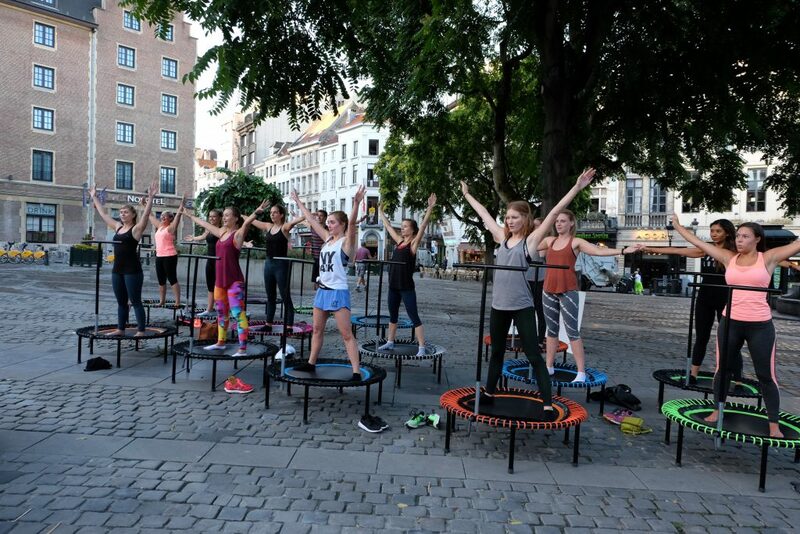 They use a Bellicon trampoline which is made in Germany and is the only trampoline that has received a AGR label. A lot of Belgium’s top athletics have implemented a training on a Bellicon! Start your day right with a good nights sleep, a healthy breakfast, a workout and you can conquer the world. Thank you Ketchum PR and Ibis Hotels for this short, yet amazing stay! I had a blast. I hope you liked this long but useful post. Leave a comment below if you would like to try one of these tips. What’s your favorite morning routine and breakfast?